Forces in Syria Are Intentionally Starving Innocent Civilians to Win the War. And It’s Working. A member of the Syrian pro-government forces stands at the entrance of the besieged rebel-held Syrian town of Madaya as residents wait for a convoy of aid from the Syrian Arab Red Crescent on January 14, 2016. Their neighbors had just slaughtered the last horse in town. “I know that horse,” Ahmed said wistfully. A second aid convoy reached the recently besieged city of Madaya today. 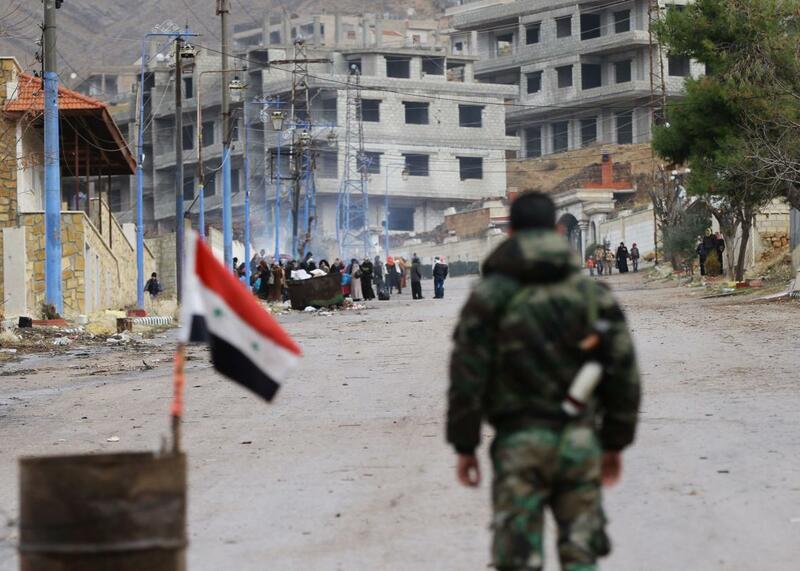 Madaya, controlled by rebels but surrounded by pro-government forces, including Hezbollah, had been under siege for five months until the Syrian government agreed to allow food aid into the city on Monday. Images of emaciated children and stories of residents forced to survive on cooked tree leaves and scouring minefields for grass to eat quickly emerged from the city that one aid worker called “effectively an open-air prison.” At least 28 people, including six babies, died of hunger-related causes at a Doctors Without Borders-supported clinic in the city. This has sparked international condemnation. Monday’s shipment entered Madaya at the same time that trucks of aid entered two Shia towns, Fua and Kefraya, which had also been besieged by rebel forces. An estimated 40,000 Syrians are trapped behind front lines without access to food and medicine, and international powers as well as the United Nations have been accused of being slow to act on the crisis while they try to entice the government and rebels to sit down at the negotiating table. Unfortunately, as Aron Lund of the Carnegie Endowment has written, starvation, “like most war crimes it is also very effective.” Or as a resident of the Yarmouk refugee camp, which was besieged by the government for three years, told the Guardian, “Through the sieges, they are pressuring the civilians so they in turn pressure the rebels and blame them for the siege.” Siege tactics allowed the government to bring several rebel-held suburbs of Damascus to their knees two years ago. It appears to be having the desired effect in Madaya as well. As one rebel told the New York Times: “In the revolution I was dreaming of democracy, freedom….Today all my dreams are food.” As for whether the sieges violate international law, in a conflict defined by chemical weapons and barrel bombs, just add it to the list.